We recently caught up with SAI Custom Programs Coordinator Marco. Marco shares his experience on a spring weekend trip with Muhlenburg College. As Custom Programs Coordinator at SAI I come in contact with several groups of students all over the year. The most exciting part of my job is when, after months of planning, a group arrives and I get to meet and greet the students on site. 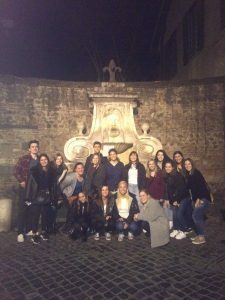 This past January we hosted a group from Muhlenberg College in Rome for an introduction to Italy before they start their semester in Florence at FUA. 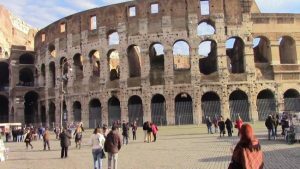 During their time here, we arranged for them to visit some of the most popular cultural attractions in Rome such as the Coliseum, the Roman Forum, the Palatine Hill and the amazing Vatican Museums. 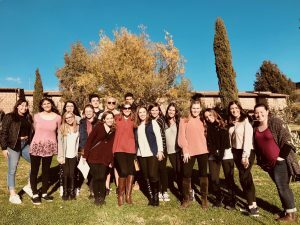 We also organized a number of group meals selecting the most famous and traditional Italian and roman restaurants, to give the chance to the students to enjoy some of the Italian food specialties. One of the most appreciated experience we organized was a food tour in the city center: besides the delicious tastings we had, the group had the chance to meet and speak with the owners of each of the shops we visited. This was a very fun and informative experience. I really love these experiences that provide students with the chance to learn unique and interesting things about my home city and country!